"This charity helps bridge the gap for families and is closely aligned with our Mercy Mission at Emory Saint Joseph's, which is providing compassionate care for those less fortunate," says Jeanne Landry, vice president of human resources at Emory Saint Joseph's. 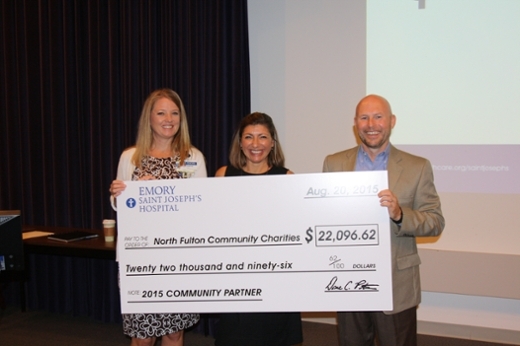 Emory Saint Joseph's Hospital employees demonstrated their commitment to those in need by presenting a check for more than $22,000 to the hospital's 2015 community partner, North Fulton Community Charities. For the past several years, the hospital has partnered with a local organization to serve those less fortunate, extending the mission of Emory Saint Joseph's in the community. NFCC is a non-profit human service agency dedicated to preventing homelessness of individuals residing north of the Chattahoochee River in Fulton County. The agency assists families with basic needs such as food, rent and utilities, clothing and adult education classes during short term emergencies. Since January, Emory Saint Joseph's employees organized many creative fundraisers which were also supported by physicians, patients, visitors and volunteers. Some of these included: yoga classes, line dancing, bake sales, raffle tickets for a quilt and gift baskets, flower sales, a bazaar and a canned good drive for NFCC's food pantry. Many Emory Saint Joseph's employees and their families also volunteered at NFCC by working on site at the organization's food pantry and Thrift Shop. Emory Saint Joseph's administration recognized the many dedicated hospital departments and employees for their significant fundraising efforts during a special ceremony at the hospital. "Emory Saint Joseph's is so grateful for our employees' support. The staff has contributed so much of their time and efforts to raise funds for NFCC, and because of their kind spirit and generosity, many families will receive assistance when it is needed most," says Landry.